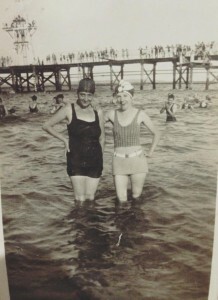 In The War Bride, ex-Sergeant Tom McBride (whom you might remember from The Soldier's Wife), gets involved in surf life saving at Manly, and teaches Margaret Dalton (the war bride of the title) to swim. 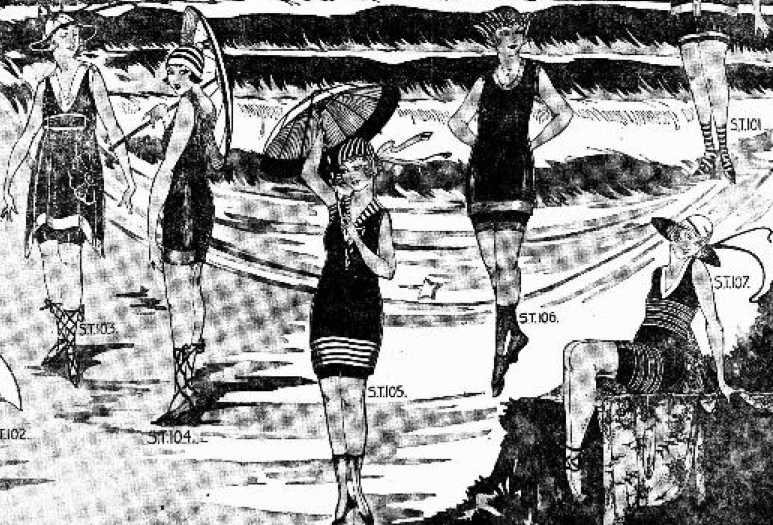 The life saving movement in Australia had started well before the War - the first clubs formed in 1907, following the removal of laws forbidding swimming in daylight. Up until then, if you wanted to go into the surf you had to wait until dark, so you wouldn't shock anyone! The costumes people wore were very heavy - mostly made of wool - and dangerous as a result, so local men o n the surf beaches like Manly and Bondi banded together to watch out for and rescue those swimmers who got into trouble*. 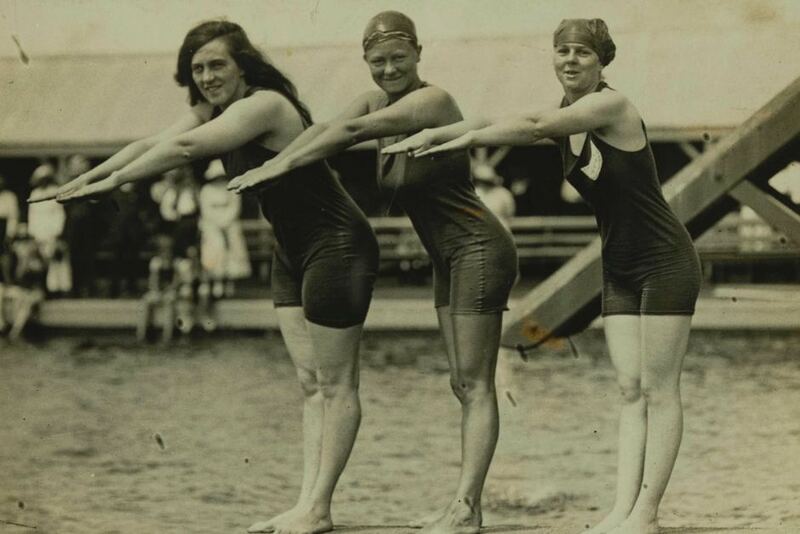 Australia led the world in reforming swimming costumes, especially for women. 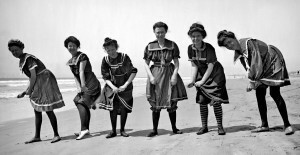 Women were full participants in surf culture and swimming. Trendsetters included Fanny Durack and Minnie Wylie, who represented Australia in the 1912 Olympics, winning Gold and Silver medals respectively. Here they are with the Bronze medal winner, Jennie Fletcher from Britain, after their 100m win. You can see that costumes have become more streamlined. 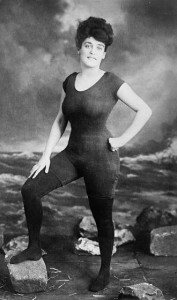 For the next 20 years or so, serious swimmer, whether they were male or female, wore the same kind of swimmers. Annette Kellerman, pictured below, was the first woman to wear a one-piece swimming costume - and she was arrested for it when she went to the beach in America in her scandalous costume! 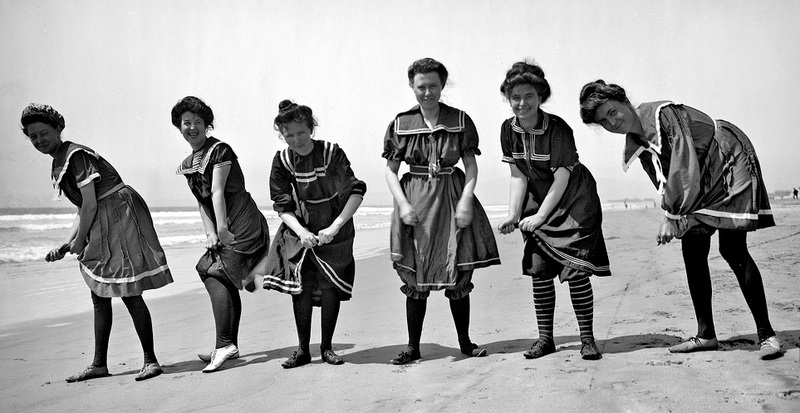 Women didn't only swim - they also surfed. One of the first serious women surfers was Isabel Letham. There is a myth that Australians learnt about board surfing from Duke Kahanamoku, a surfing champion from Hawaii. In 1915, Duke Kahanamoku gave a terrific exhibition of surfing at Manly, and then invited any of the local male swimmers to get up with him on the board, assuming they'd never surfed before. However, board riding had been going for some years on Australian beaches. I've always loved the fact that no one told him - they didn't want to rain on his parade, I suspect, but they weren't prepared to get up and pretend to be newbies. In the end, Isabel Letham volunteered. Maybe the fact that the Duke was good looking man had something to do with that! Isabel is therefore usually called 'Australia's first woman surfer', but the odds are that she, and others had already had a go at it before then. In any case, she became a champion surfer - you can see from the picture how fit she was! 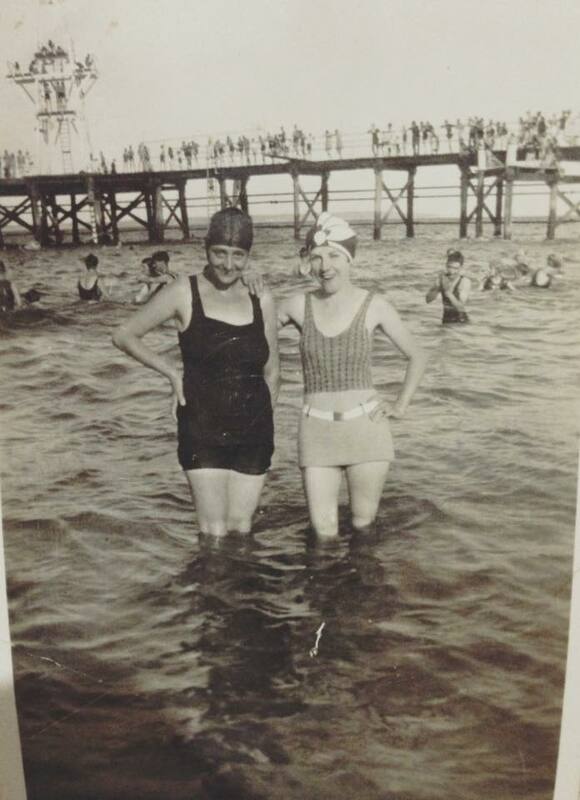 Swimming costumes quickly became a matter of fashion and Australian women were given quite a choice - within the bounds of modesty, naturally! 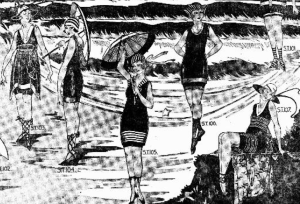 In the image below, taken from a 1920s' ad, the girl with her hands behind her back is wearing a Canadian suit like Margaret wears in The War Bride. It all looks a bit sedate and posed, but I think the photo below (from 1933 at Manly), says it all! *Many thanks to Ray Moran of Manly Life Saving Club for all his help in researching surf lifesaving.